Take the King's Challenge! Adventures await! Take the King’s Challenge! Construct and upgrade homes and buildings for the citizens of the Kingdom and win prizes for speed and quick wit. Become the chief city planner of marvelous Islandshire and save it from the merciless forces of nature in Royal Envoy. Team up with Cedric once again and travel to the faraway land of Middleshire devasted due to the poor management and negligence of its rulers in Royal Envoy 2. 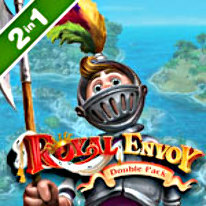 Think your way to triumph in challenging and mesmerizing Royal Envoy Double Pack! -Be the Hero the Kingdom seeks!